The concept of Jughandle’s Fat Farm is to lead our followers to a healthier existence by teaching and examining the simple acts of gathering food (shopping, growing, etc) and preparing a meal. Once everyone understands why we eat and what the food does to our bodies we can then choose the path we would like to follow instead of being pulled by the pallet down the road of fast food and pre-prepared meals. Every one from Man to child should know how to cook (not just forage in the refrigerator) when they are hungry. I’ve been told that Cooking an Egg is one of the most basic and important skills a cook can master. I would like to know that when I say to separate 7 eggs into two bowls, you aren’t going to just put 3 eggs in one bowl and 4 in the other. Eggs are the most complex and important ingredient we will cook with. Because they are high in protein which is constructed of coiled molecules, they react to different methods of preparation. Heating or the friction or whipping (also heating) causes those coils to unwind. They attach to each other when they unwind creating a mesh that traps air or liquid that becomes permanently set when the mixture is heated to the setting point. You can observe the trapped air reaction in whipped egg whites and the liquid in a custard. The difference between a thick egg mixture and scrambled eggs is just 10 degrees. So most egg dishes should be cooked slow and low to better control the results. Trick: to make a speedy custard, add cornstarch or flour to your mixture to speed the formation of the protein mesh, thus stretching the window between success and a curdled mess. Eggs also provide moisture to a dish, which when heated creates steam and aids in the rising of cakes and pastries. They are also emulsifiers, one end of the molecule attracts water and the other attracts oil. That is why you need an egg in a salad dressing such as Caesar’s or in a thicken dressing such as mayonnaise. place 4 to 6 three day old eggs in a sauce pan. In a pan of rolling boiling water put 1 tablespoon of white vinegar for every 6 cups of boiling water. Swirl the water by stirring and gently crack the egg into the center of the whirlpool. Cook 2 mins for a running center, 3 mins for a thick center and 4 to five minutes for a hard cooked center. Remembering the slow and low method, most fried egg problems such as, over cooking, crispy edges or dried out whites, are caused from cooking too hot. Start your frying pan on med high then once the pan is hot turn it down to med-low. Put in 1 tablespoon of butter and crack the egg into to butter. For “over easy” eggs, wait until the white has set and gently flip or turn the egg with a spatula. Continue to cook until the yellow is done to your likeness. For “sunny side up” or “partial eclipse” eggs, cook until the white is almost set the add a tablespoon of water to the pan and cover with a lid. Steam the egg until the yolk is to your likeness. Crack two eggs into a small bowl. Add 3 tablespoon of cream, salt and pepper to taste. Cook in a non-stick skillet on med-low until done, stirring with a wood spoon as needed. You can also use a double boiler over simmering water to cook these eggs. Start with 2 eggs. Whisk in salt (a pinch) pepper (to taste), fresh herbs (tarragon is nice) and 1 teaspoon of water per egg. 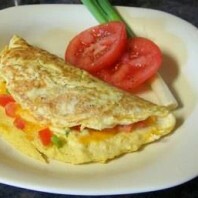 Melt a tablespoon of butter in a non-stick or well seasoned omelet pan over medium-high heat. slide the omelet to one side of the pan by tilting the pan. 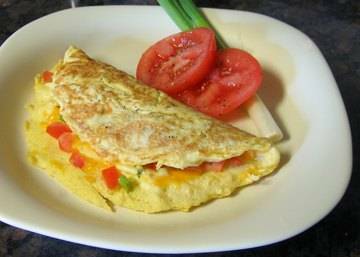 Turn the omelet over to finish cooking for about 30 sec.